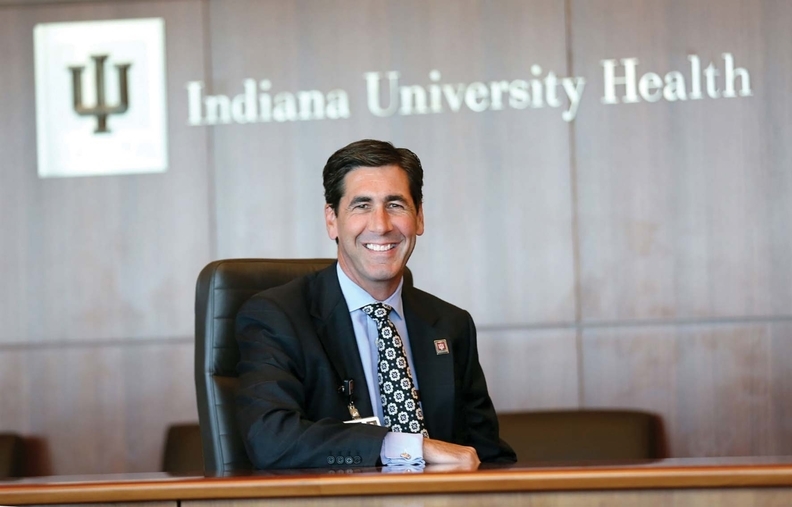 Earlier this month, Dennis Murphy became the CEO of Indiana University Health, the largest healthcare system in the Hoosier state with revenue approaching $7 billion a year and an enviable 12.8% operating margin in 2015. Modern Healthcare reporter Bob Herman recently spoke with Murphy about his early goals and how he views risk-based payment models. The following is an edited transcript. Modern Healthcare: What are your main priorities as the chief executive of the largest health system in Indiana? Dennis Murphy: How do we improve the health of the state of Indiana? We do that directly through the care that we provide in our facilities, through our physicians, through all of our care teams. But then I think also how do we do that in partnership with others? That may be with other health systems, it could be the hospital association, it could be governmental or nongovernmental entities. Indiana does not rank well in terms of national health statistics. We believe that we have a great state to live in and to work in, but healthcare is not what it should be. We believe we have a responsibility to help make the citizens of this state healthier. MH: What specifically do you want to do to improve health? Murphy: We've worked with our university through the school of medicine, the nursing school, the school of public health to think about a couple of focal areas to begin with. We would really like to start with infant mortality, obesity, smoking cessation and behavioral health issues. Over a 10-year time frame, we would like to demonstrably improve those metrics for the state. We are probably going to start with infant mortality. We believe that infant mortality is something we can get our hands around. MH: Pockets of Indiana also suffer from opioid abuse. Murphy: The most notable area where there has been opioid abuse is Scott County, which is in the southeastern part of the state. The issues related to substance abuse and, particularly, the relative weakness of the behavioral health system, are not unique to Indianapolis or Indiana. That is a nationwide issue. Behavioral health services have been undervalued in the healthcare system probably for a couple of decades. MH: How has Republican Gov. Mike Pence's version of Medicaid expansion affected IU Health, notably its cost-sharing among Medicaid recipients? Murphy: It has been very positive for the state. And I give the governor a lot of credit for actually being willing to expand Medicaid. He was in Congress voting against the Affordable Care Act before he became governor. But what I think he believes is that it is better for the health of the state, and it is better for people to have access to good healthcare than the alternative. What he wanted, though, was to mirror an existing program that was in place. The program here for Medicaid expansion is known as Healthy Indiana Plan 2.0 because there was a HIP 1.0 which had some nominal copayment required for that. We have seen fewer ER admissions from this same population as a result of having insurance, so it is changing behaviors that I think are positive. MH: IU Health has its own insurance arm, and it is growing rather quickly, especially in Medicare Advantage. Murphy: The health plans are a manifestation of a strategy where we know we are going to have to take risk in the future and be responsible for the overall outcomes of a population. When the health plans were initiated here, it was considered an R&D experiment that we wanted to make sure we learned how to do. What we found is that we are actually good at this. The first commercial people enrolled were our own employees. We have not only seen a slowing of the rate of growth in terms of healthcare expenses, we have seen a real reduction in the cost of healthcare for our employees. We have partnered with another hospital here in Indianapolis in a Medicaid HMO product. We have done well in managing that. And then, as you said, Medicare Advantage seems to be a population that is attracted to a comprehensive integrated healthcare delivery system providing that coverage rather than a traditional insurer. MH: Do you see the health insurance division being a big driver in moving the system away from fee-for-service? Murphy: There are a lot of people who have referred to fee-for-service as curve one and full risk as curve two. I have described us as being curve 1.2, so we are only nominally down that pathway. But I think all of the economic incentives point long term to moving down that pathway. We want to be prepared to succeed when that happens. As I talk to our clinicians and providers who have large panels of these insured patients, they like the model. They like taking full responsibility. They like to be able to provide more services to those patients who have complex, comorbid conditions and need wraparound services. MH: Will full risk become the predominant way that providers are paid? Murphy: Some combination of that. I am a big believer in partnerships, so I don't know that you necessarily have to take full risk in those agreements. But I think you will be required to take some amount of risk, and whether we work with big insurers collaboratively to do that, or whether it is through our insurance plan where we are taking that full risk remains to be seen. MH: Has IU Health felt the tension in the shift toward high-deductible plans? Have you seen more patients struggling to pay bills? Murphy: Indiana ranks in the top five in terms of penetration of high-deductible plans, so we see that acutely every day. It has created a higher set of patient responsibilities and patient balances. What it has required us to do is work closely with patients. You become a financing entity for patients and their bills in a way that you haven't had to in the past. But, more importantly, it has made us more consumer-conscious (because) patients now will do research. They will understand their options. They are truly making decisions about value. MH: Are there concerns, though, that people are putting off care because they don't want to feel the immediate effects of their deductible? Murphy: That happens with high-deductible plans. But I would say that also happened in the economic downturn in 2008 and 2009. People are price-sensitive around access to care. And anything that creates that sort of situation for people where they are making personal trade-offs is going to be a problem. But the alternative we have seen has not controlled our costs nationally. If patients don't have any responsibility, you see utilization go much higher. MH: How has IU Health handled surprise medical bills, considering you are both the provider and payer? Murphy: We have not seen a large propensity for surprise bills, and that is largely because we fundamentally believe that we need to be a well-integrated system of care. We have over 2,500 employed physicians throughout the health system. We have a large number of private physicians who participate with us through contracting vehicles. So we believe we are very well-aligned in terms of our providers throughout the system. That is backstopped with … financial navigators who are actively seeking to help people who don't have insurance find insurance. They also do all of the billing resolution for those patients.